We have expertise in the variety of software development methodologies and we utilize the best one suited for your software development project. 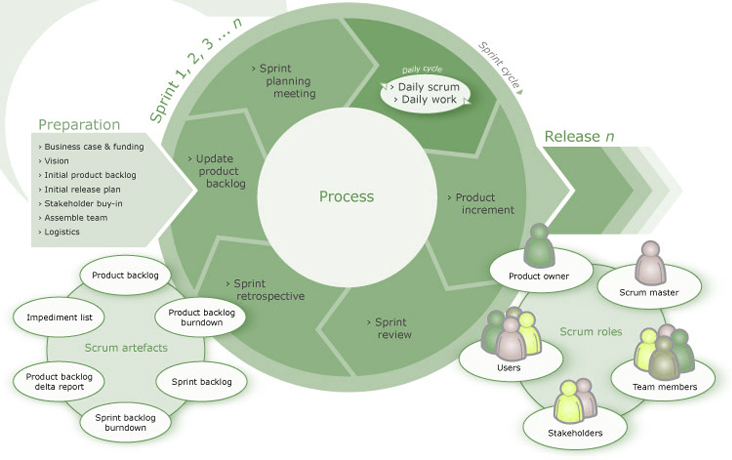 Agile Methodology is one of the most popular methodologies currently being used for software development. It can enable companies to deliver a flexible, scalable and adaptive software development experience. It helps quickly create working software, in frequent iterations, building the highest priority features first. This is precisely why I-Link has chosen Agile methodologies to build and maintain high-quality software products. It has helped us to successfully release numerous products into the market. Sprints are iterations that may typically last from two to six weeks and the working product is demonstrated to client at end of each 'Sprint'. This helps minimize overall risk, and let the project adapt to changes quickly. The goal is to have an available release with working features at the end of each Sprint. Multiple iterations may be required to release a product or new features. Our success formula is quite simple. It is a blend of acts such as emphasizing on people, communication, working software, and responding to change. The methodologies used by I-Link teams are well thought-out for efficient business management and requirement analysis. In the development process, we use latest technology and use the best development methodologies for accomplishment of projects successfully. Rapid application development method was developed in 1970. Traditionally the rapid application development approach involves compromises in usability, features, and/or execution speed. The initial requirements analysis and design phase is interleaved with development of prototypes and partial implementation of the software. Our rapid application development methodology involves iterative development and the construction of prototypes. Waterfall model is the most common version of Software Development Life Cycle (SDLC) for software development. This model is preferred where the requirements are clearly and un-ambiguously outlined. An improvement of the waterfall model is “Iterative Waterfall Development Model”. It involves less risk than traditional waterfall approach. In this method, the complete project is divided into various phases. And each phase is executed based on traditional waterfall method. Dividing big projects into identifiable phases reduces the risk involved. It is generally chosen over the waterfall approach for large, expensive, and complicated projects.